Monasca provides monitoring as a service for OpenStack. It’s scalable, fault tolerant and supports multi-tenancy with Keystone integration. You can bolt it on to your existing OpenStack distribution and it will happily go about collecting logs and metrics, not just for your control plane, but for tenant workloads too. So how do you get started? Errr... well, one of the drawbacks of Monasca’s microservice architecture is the complexity of deploying and managing the services within it. Sound familiar? On the other hand this microservice architecture is one of Monasca’s strengths. The deployment is flexible and you can horizontally scale out components as your ingest rate increases. But how do you do all of this? Enter OpenStack Kolla. Back in 2017, Steven Dake, the founder of the Kolla project, wrote about the significant human resource costs of running an OpenStack managed cloud, and how the Kolla project offers a pathway to reduce them. By providing robust deployment and upgrade mechanisms, Kolla helps to keep OpenStack competitive with proprietary offerings, and at StackHPC we want to bring the same improvements in operational efficiency to the Monasca project. In doing so we’ve picked up the baton for deploying Monasca with Kolla and we don't expect to put it down until the job is finished. Indeed, since Kolla already provides many required services and support for deploying the APIs has just been merged, we're hoping that this isn't too long. By providing a suitable medium for thought, the tenant no longer has to sift through streams of data to understand that their job was running slow because Ceph was heavily loaded, or the new intern had saturated the external gateway. Of course, exposing such data needs to be done carefully and we hope to expand more upon this in a later blog post. So how else can we help tenants? A second area that we've been looking at is logging. Providing a decent logging service which can quickly and easily offer insight into the complex and distributed jobs that tenants run can save them a lot of time. To this effect we've been adding support for querying tenant logs via the Monasca Log API. After all tenants can POST logs in, so why not support getting them out? One particular use case that we've had is to monitor jobs orchestrated by Docker Swarm. As part of this work we knocked up a proof of concept Compose file which deploys the Monasca Agent and Fluentd as global services across the Swarm cluster. With a local instance of Fluentd running the Monasca plugin, container stdout can be streamed directly into Monasca by selecting the Fluentd Docker log driver. 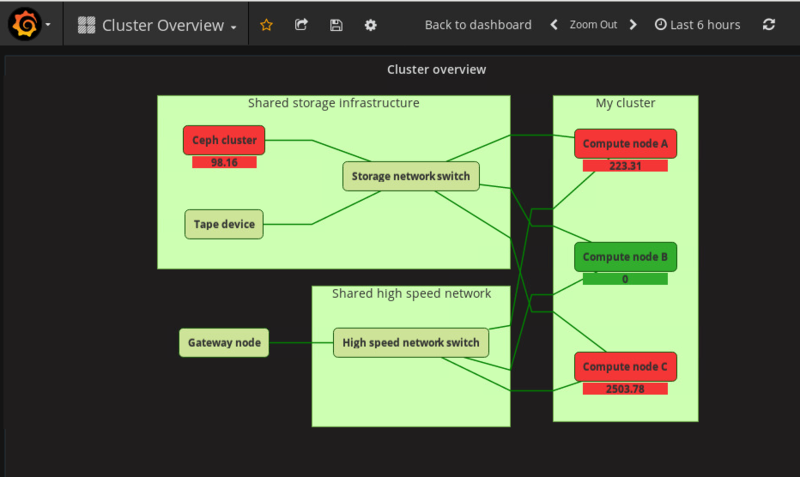 The tenant can then go to Grafana and see both container metrics and logs all in one place, and with proper tenant isolation. Of course, we don't see this as a replacement for Kibana, but it has its use cases. Finally, we'll finish up with a summary. We've talked about helping to drive forward progress in areas such as deployment, data visualisation and logging within the Monasca project. Indeed, we're far from the only people with a goal for bettering Monasca, and we're very grateful for the others that share it with us. However, we don't want you to think that we're living in a bubble. In fact, speaking of driving, we see Monasca as an old car. Not a bad one, rather a potential classic. One where you can still open the bonnet and easily swap in and out parts. It's true that there is a little rust. 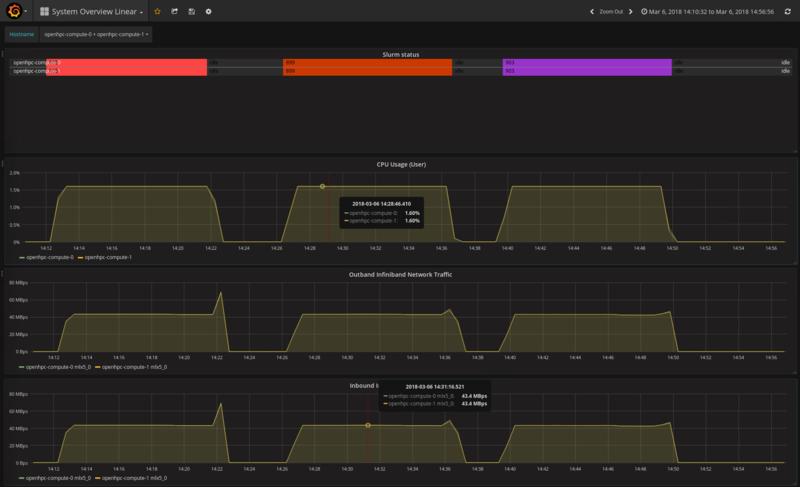 The forked version of Grafana with Keystone integration prevents users from getting their hands on shiny new Grafana features. The forked Kafka client means that we can't use the most recent version of Kafka, deployable out of the box with Kolla. Similar issues exist with InfluxDB. And whilst the rust is being repaired (and it is being repaired) newer, more tightly integrated cars are coming out with long life servicing. One of these is Prometheus, which compared to Monasca is exceptionally easy to deploy and manage. But with tight integration comes less flexibility. One size fits all doesn't fit everyone. Prometheus doesn't officially support multi-tenancy, yet. We look forward to exploring other monitoring and logging frameworks in future blog posts.